Pitching Crank Baits for Walleyes by Jason Mitchell for Walleyes Inc.
Over the past few years, pitching or casting to reach shallow walleyes has increased in popularity amongst walleye anglers tenfold. Some fisheries like North Dakota’s Devils Lake have long had a casting cult but pitching or casting is no longer as regional or confined to a specific body of water. Especially when walleyes are relating to shallow structure, you can do a lot of damage by casting to the fish. When we look at effectively fishing less than ten feet of water, there are several ways to skin a cat. Drifting and trolling these locations are options. Often however early in the season, fish seem to bump away from the boat more. Might have to do with clear water often associated with cool water temperatures before algae blooms can stain the water, maybe the metabolism of the fish has something to do with this phenomena. Whatever the reason, it can be tough to drive right over the top of fish early in the season and casting allows you to focus on a specific area with some precision. While casting or pitching can be very precise and even methodical where you can plant on a specific location, you can also cover water. The best of both worlds for shallow walleyes. Regardless however whether you are fishing blade baits, jigs, swim baits or crank baits on either moving water or still, there are some nuances that can definitely elevate your pitching game. Like many facets of fishing, speed and mojo is everything. As a guide, I often liked to have everybody in the boat using identical rods, reels and line so that any successful recipe was easier to repeat within the boat. If you and a partner spend a lot of time fishing together, use identical gear. Reason being, when he or she catches three fish in a row, you can watch their reel speed and match up identically. If they are using a completely different reel with different gear ration and spool, you might be reeling much slower for example but still moving faster in the water. Matching up is much more difficult with different equipment so keep some consistency within the boat. Early in the season, slow methodical retrieves often shine and what often happens after catching a few fish is that inadvertently, we begin to reel faster because of excitement. Force yourself to be conscience of how fast or slow you are fishing and make mental notes so that you can tone back or pick up the tempo with some consistency to match up what is working. As important as reel speed can be when pitching or casting, there is a whole host of other variables like snaps, pauses, lifts and swings that can make a crankbait, jig, soft plastic or blade bait come to life. These subtleties can only be dialed in on the water with experimentation. What often goes unsaid however and can be as or more important is angle of the cast… how you approach a shallow location and work a lure across the location. Some anglers preach keeping the boat deep and casting in shallower but throwing perpendicular to the shoreline from deep to shallow is just one angle to present a bait. The advantage of this approach is that you cover different depths. If fish however are holding tight to a specific feature like a lip or cut along the profile of the shoreline or reef however, there are often better angles. One such angle is where you slide the front of the boat into the same depth as to where the fish are holding and instead of casting across the break from deep to shallow, casting along the break so that your bait follows the break. Essentially casting up ahead of the boat where the lure or bait works the same depth for the entire cast along a contour. What I have found is that regardless of where you fish and where, the angle you approach a spot and the distance of your casts are as important of variables as speed, color, lure, weight or what you do with the rod tip. When fish are tight to shallow structure and hugging the bottoms of lips and dips, a lure has to get to the fish and give them a chance to respond. When fish are aggressive and positioned off the bottom and willing to follow or chase a lure, you can just get close so that situation is much more forgiving. The author Jason Mitchell believes that experimenting with casting angles can often make pitching for early season walleyes much more productive. Also, on days where the fish are cruising off the bottom and looking for something to eat, you can make a short cast at just about any angle near the fish and get bit. As conditions do get tougher, walleyes in particular will often follow a bait or lure a considerable distance at times before finally biting. If you are getting bumped right at the boat repeatedly, that is what is happening. In this situation, longer casts often get bit and one of my favorite tactics is to back off the spot and keep the boat over deeper water and try and pull the fish over the deeper water with a longer cast. Long casts just give following fish that many more chances to nip before you just run out of room at the end of a retrieve. There is usually a specific angle that when matched with a specific lure works because of efficiency… staying in front of the fish. This spring, move past the traditional logic of holding the boat deep and simply firing the bait up towards shallower water. There is much more to experiment with that can make you much more effective when pitching shallow water walleyes. 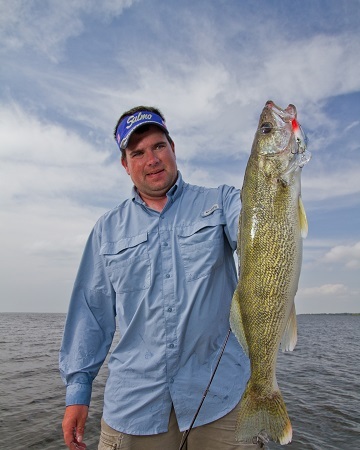 Editors Note: The author Jason Mitchell earned a reputation as a top walleye guide on Devils Lake, North Dakota before hosting the television show, Jason Mitchell Outdoors which airs on Fox Sports North at 9:00 am Sunday mornings and Fox Sports Midwest at 8:30 am Saturday mornings. Show listings and schedule can be found at www.jasonmitchelloutdoors.com.